By Travis - Greece - 15 Sep/03 - Viewed 1578 times. Our flights from St. Louis to Detroit to Amsterdam to Athens took nearly a full day. The transatlantic flight was on an Airbus 330-300, with a top of the line video, music and gaming system in each seat, so that kept us occupied throughout the night when we should have been sleeping. By the time we rode the bus from the Athens airport to the city center we couldn't keep our eyes open. We went to bed at 5:00 PM and slept for about 12 hours. The next morning we walked to the National Archeological Museum, only to find it was closed for several months of renovations. We strolled through the older section of town, then visited the Acropolis. Everything in and around Athens is under construction, renovation or reorganization in anticipation of the 2004 Olympics, and the Acropolis was no exception. 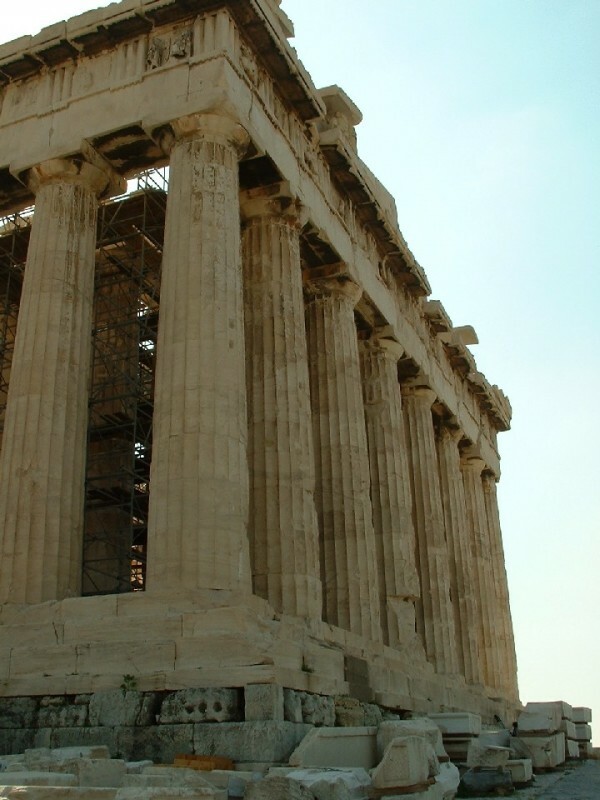 The Parthenon was partly taken apart for repairs, and had a crane situated right in the middle. The museum on the grounds was interesting, but packed with visitors, so we didn't enjoy it all that much. That afternoon we visited some of the other ancient sites in the vicinity of the Acropolis. Our yearning for marble columns and headless statues was more than satisfied. We left on a ferry to Syros that afternoon, and left the construction fencing, high prices and congestion of Athens behind.